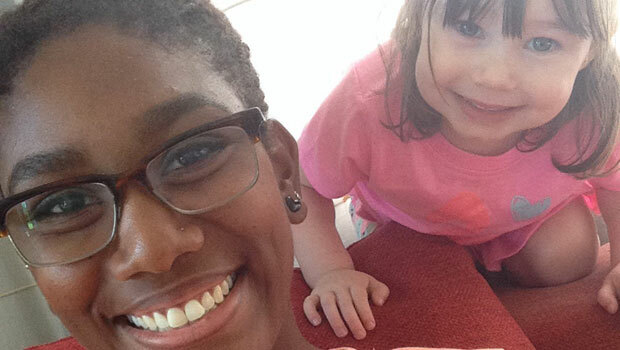 Kyelaya R. from the United States is an au pair in New Zealand. The toddler stage is when the baby becomes a child. It is a very busy and very interesting time of child development. Toddlers like to practice their new skills. Toddlers like to run and climb, but they don’t always do it well. Toddlers like to move things and make things happen. Toddlers like to explore their world. Toddlers like to do things for themselves. The word "toddle" means to walk unsteadily, so it is an appropriate description for children this age. Toddlers like to run, but have difficulty stopping and turning. Early walkers fall down a lot - and sometimes won’t cry unless they know you’re watching! Toddlers can learn to drink from a straw or sippy cup, feed themselves with a spoon, and can walk up stairs with help. This new physical independence means that toddler caretakers must be more vigilant than ever; children of this age want to explore their surroundings by running, climbing, and reaching, but don’t understand that they can get hurt. Work together with your host family to make sure the house is toddler-proof. Kitchen cabinets should have safety latches on them. Electric outlets are dangerous. Cover them with special outlet plugs. Cover sharp corners on furniture. Don’t let toddlers jump on beds. Guard staircases carefully. Toddlers love to climb, and stairs can be dangerous. Put stickers or adhesive decorations on sliding glass doors so that toddlers don’t run into them. It can help to actually get down on their level and see what they see. This will help you to imagine what they might want to play with or grab. Toddlers love to turn lights on and off, so be careful when they have wet hands. Remember that nothing is sacred to a toddler: He will go through your bag, tear up your letter from home, and throw things off the table. He’s not trying to make you angry - he is just exploring his world. Toddlers are all about action; they don’t understand consequences. Toddlers are also very messy - learning by doing often involves making a mess. Understand that toddlers occasionally need to be messy. Keep the mess contained in a room that is easily cleaned, like the kitchen, and let her help you clean up the mess, just like a big girl. If there are also older children in the house, help them to make sure their toys are safe. Tiny toy pieces are dangerous to very young children, who put everything in their mouths. Toddlers will also easily break their brothers’ and sisters’ toys, which is sure to cause unnecessary drama. Like babies, toddlers enjoy playing with things that aren’t toys, such as pots and pans. They love to play with water and in the sandbox. Toddlers need a lot of sleep, sometimes almost twelve hours a night, plus a nap during the day. Understand how much the toddler in your family needs so that you can plan her day. Tired toddlers are more likely to throw temper tantrums, and to be difficult. Toddlers are interested in learning to feed themselves, and may even refuse to be fed by an adult. Toddlers need to learn how to drink from a cup instead of a bottle. This new independence at mealtimes will mean a bigger mess, but it is important that they learn these skills. Toddlers enjoy the social aspects of a family meal, and like to sit with family members as they eat, though toddlers may only be able to sit for five to ten minutes before getting restless. Toddlers love to help prepare the food. They want to try to pour their own drinks (try putting one or two cups of liquid in a small pitcher to avoid giant spills) and even want to help clean up after they eat. Encourage the toddler to wash their hands before eating, and support their attempts to do things for themselves. Toddlers are fascinated with objects. Unlike the imaginary play of older children, toddler play is usually more focused on the object, how it works, and what it can do. Riding on simple riding toys. Showing you what they know. Ask the toddler to give you “something red” or “the blue toy car.” Ask toddlers about what they see and do. Playing with blocks: building towers and knocking them down. Singing and dancing with you. Sorting toys and other objects. Mimicking adults, with toy telephones, cars, and other real-life items. Pushing, pulling, filling, and emptying toys. Spending time alone in “private” spaces, like a large box or under a table with a tablecloth. Tapes or CDs of children’s music and nursery rhymes. Make sure all toys within reach of a toddler are appropriate for his age. If a toy can fit inside a toilet roll, it is too small for a toddler. The child may swallow it and choke. Do not allow toddlers to play with balloons or plastic bags. Too many toys at once can overwhelm a toddler. By keeping many toys hidden out of sight, you can introduce them to the play area whenever the child needs a “fresh” toy. This will also help to avoid creating too big a mess. Toddlers are not too young to draw, and love to “scribble” with large crayons. Scribbling may not look like much to adults, but it’s actually an important step in a child’s artistic development. Be sure to supervise toddler art activities, or they might decide to create art on the wallpaper. Children this young can also use student scissors and glue with help. They love to make art for the adults in their life, and will probably present you with many wild creations, made just for you. Toddlers begin to gain some control over their bodily functions during the second year of life. Talk with your host family about how they prefer to handle toilet training. Some families strongly encourage their children to use the toilet as soon as possible, while other families prefer to wait until the child shows a strong interest in using the toilet - most start around the age of two. Typically, many children will not gain full control over this function until they are at least three, and most boys take longer than girls. Whether your host family prefers an aggressive toilet-training agenda or a more casual approach, the most important part of toilet training is consistency. You and the host family need to work together to help the child make a smooth transition out of diapers. Reverting to diapers after the child has been wearing underwear will confuse the child and prolong the training process. Children undergoing toilet training do not have the control that adults do over their bodies. They really can’t wait when they have to go. If you are away from home with the child, and the child tells you she has to use the bathroom, find facilities as soon as possible to avoid an accident. Children going through toilet training are very embarrassed by their accidents - they want to be big boys and girls, and they want to impress you with their newfound maturity. You can help them through this challenging time by being sensitive to their feelings, and by supporting their efforts to use the bathroom. Praise them lavishly when they successfully use the grown-up bathroom, and soothe them when they have an accident - don’t scold them. 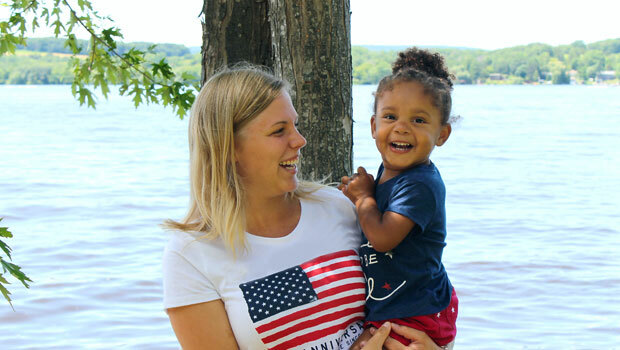 Kim A. from Germany is an au pair in Pennsylvania, USA. Toddlers like to imitate adults. Toddlers like to watch people. Toddlers like a predictable routine, and being told what is going to happen. Toddlers like to know where you are. Toddlers like to keep toys to themselves. Toddlers like to make decisions. Toddlers like adults to show interest in them. Toddlers like to interact with other children. Toddlers like to express their feelings. “The Terrible Twos” is the age when children first begin to demand independence. Their favorite words are frequently “No!” and “Mine!” Toddlers do not know how to share and are very possessive. They tend to be very impatient. They probably won’t learn skills like sharing and patience until they are older. They can be physically aggressive when they get upset, and may resort to hitting and biting because they don’t have enough language skills to express their feelings. If the toddler in your house hits or bites, be firm: Say “Ow! No biting!” Let the child know that hitting and biting hurt, and teach positive alternative behaviors, like using words to express feelings. If the aggressive behavior continues, try a time out or other method of discipline (see Part Two for details). Ask your host parents for their suggestions on how they want their child to be disciplined. Toddlers can be very moody: happy one minute, then screaming the next. Transitions can be difficult for toddlers: They don’t want to stop what they’re doing when you need them to do something else. Give a toddler lots of warning (“It’s almost time for lunch!”) and get them excited for the next activity (“Oh boy, this lunch looks really good!”). This will make transitions easier for children of any age. Luckily, in addition to being difficult, toddlers also begin to show concern and sympathy for others. They like to show affection, and are very generous with kisses and hugs. Children this age may become particularly attached to a special toy or baby blanket, and may become quite upset when the toy or blanket is not available. They are old enough to help you clean up their toys. Toddlers will want to do many things on their own. They want to acquire new skills and become big boys and girls as fast as they can. If a child wants to attempt something that you think is too difficult, offer to “do it together,” instead of preventing the child from trying. This will foster the child’s self-esteem, and will also make your life easier by avoiding a lot of temper tantrums. You can avoid a lot of toddler stubbornness by offering them simple choices. Instead of asking “Do you want some juice?” ask them “Do you want apple juice or grape juice?” Instead of telling them to put their shirt on, ask them if they want to wear their blue shirt or red shirt. This helps the child to feel as if they have some control over what they do. Keep choice options to a minimum, however; too many options will confuse and overwhelm the child. Young children can’t fully understand the difference between right and wrong, or how actions have consequences. Toddlers and preschoolers do not always understand the difference between intentional and unintentional actions. They are naturally egocentric, or self-centered. They don’t understand others’ perspectives, or even understand that there might be other perspectives that differ from their own. Toddlers want to be just like their older brothers and sisters, and may become frustrated when they can’t do everything that the older children do. If a toddler begins to become upset during play with older children, engage her in a developmentally appropriate game or toy. Encourage older siblings to be patient, and praise them for their help and maturity. Almost all toddlers love animals, and will squeal with enthusiastic glee when they see a family pet. Children this age, however, have a hard time expressing their affection appropriately. Supervise the toddler’s interactions with any family pets to make sure those excited hugs aren’t too tight, and that soft petting isn’t more like hitting. Show the toddler that animals need to be handled gently. Toddlers may also be afraid of certain animals. This is very normal and developmentally appropriate. See the Fear information in Part Two for more on this topic. Toddlers like to talk and listen to adults. Toddlers like to look at books and to be read to. Toddlers like to ask questions. Continue to talk to your toddler about everything. During this stage of development, children are building vocabulary at a very rapid rate, and may know several hundred words by the time they turn two. They can also understand many more words than they can actually say. Toddlers learn how to use simple sentences (“Daddy sit” or “I go there”). Toddlers love singing, and will even sing to themselves when playing alone. They are old enough to learn simple etiquette, saying “Please” and “Thank you” when reminded. You can encourage their language development by building on what they say. If Ben says “doll there,” you can respond “Yes, the doll in the blue dress is over there on the couch!” These early conversations help toddlers to acquire language quickly. More importantly, they enjoy talking to you! They want to know that you understand what they are saying. Toddlers can follow simple directions (“Go into the bedroom and get the teddy bear, please”) and often very much enjoy following commands, because they want to show you they understand. Use descriptive language. Toddlers love rhymes and simple stories, and will ask you to read the same rhyme or to sing the same song again and again. Storybooks for toddlers should be simple, fairly brief, and have large pictures to hold the child’s interest. Stories that involve repetition are wonderful for this age. Reading to children is very important, but children this young won’t sit still for books that are too complicated.